How does a pumpkin seed become a pumpkin? Why do some plants require more sunlight than others? Even as a young child, George Washington Carver’s mind was consumed with these questions. George Carver and his older brother, Jim, were born slaves on a farm in Diamond Grove, Missouri. Their parents died when they were very young, but their owners kept them on and raised them, even after slavery was abolished. George had a passion for learning, so the Carver’s sought help from a tutor. But soon, George’s knowledge outweighed that of his teacher. At the age of 12, he struck out on his own to study at a more advanced school for blacks. When George Carver attempted to enter college, he was turned away when it was discovered that he was black. He later enrolled at Simpson College where he studied art. Later he transferred to an agricultural college. Appointed by Booker T. Washington, Carver went on to head the agricultural department at the great Tuskegee Institute in Alabama, where he made significant contributions to the field of agriculture, particularly with the use of the peanut. With quiet strength, a hard work ethic and boundless creativity, George Washington Carver propelled himself to national success, though his notoriety never penetrated racial prejudice of the time. Krensky uses warm simple language to tell an inspiring story. Coretta Scott King Honor winner, Wil Clay, illustrates the story in a realistic style and with historical accuracy. 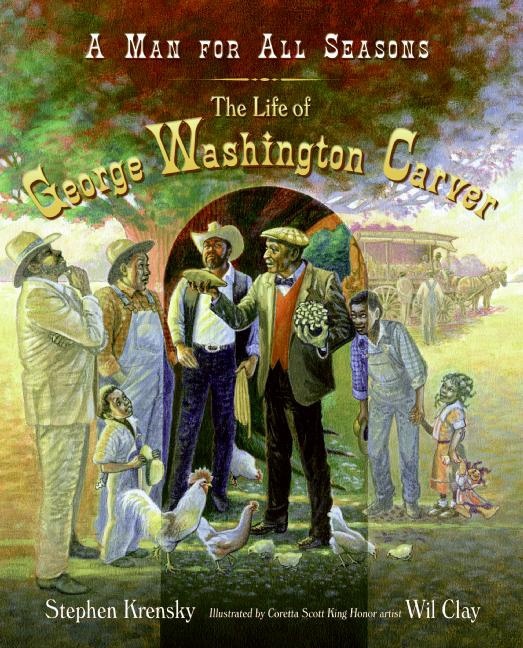 The story of George Washington Carver is one every child should know. Included is a chronology of important events in Carver’s life.